Bihar Polytechnic 2019: Bihar Polytechnic/Diploma 2019 Exam is a state level entrance exam. The official conducting body is Bihar Combined Entrance Competitive Examination Board (BCECE). Candidates who qualify Bihar Polytechnic 2019 exam get admission in the field of engineering & non-engineering diploma courses. Students who fulfil the below-required eligibility criteria get admission into Bihar Polytechnic DCECE 2019 diploma courses. Every year Bihar DCECE conducts an entrance exam to shortlist the students for admission into the Diploma colleges of Bihar. Through this article, candidates can get complete information about Bihar Polytechnic (DCECE) 2019. 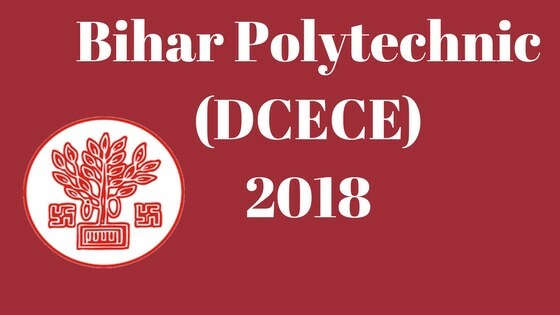 Bihar Polytechnic DCECE 2019 Exam Date: Here we have provided the detailed information related to Bihar DCECE 2019 events. Once the official information brochure releases, the below table will be updated soon. Some significant details of Bihar Polytechnic 2019 DCECE Exam are provided in the table below. Bihar Polytechnic 2019 Eligibility Criteria: To get admission into the first year of the three years Bihar diploma programme, students need to possess the below mentioned eligibility criteria. There are different criteria for different diploma courses mentioned below. Students are advised to check the DCECE 2019 eligibility conditions carefully before registering for the Bihar Diploma Counselling. The Bihar Polytechnic 2019 Application Form is scheduled to release in the 1st week of January 2019 in online mode. Interested candidates can register online till 1st week of April 2019. Uploading of scanned images and payment of application fee is also needed to be done. Amount to be paid as application fee depends on the category. Applicants need to select the particular course (PE/PPE/PMPMD) during application form filling. To register for Bihar Polytechnic 2019 is a seven-step process. All the steps are mentioned in detail below. Download part A & B. Candidates who have applied for Bihar Polytechnic 2019 must go through the Bihar Polytechnic 2019 Exam Pattern. DCECE 2019 Exam pattern provides detailed information related to question pattern, marking scheme, number of question, subject combination dates. 4. Duration The exam duration will be 2 hours 15 min. 8. Marking Scheme 5 marks will be allotted to the candidates. 9. Negative Marking For negative response, no marks will be deducted. The Bihar Polytechnic 2019 syllabus will be different for each course. Candidates must prepare for the exam as per their choice of course. It will contain topics & chapters of Physics, Chemistry, Mathematics, General Science, Numerical Ability, Hindi, English and General Knowledge. Bihar Polytechnic 2019 syllabus will be comprised of class 10th standard. The admit card of Bihar Polytechnic 2019 is likely to release in the 1st week of May 2019. Bihar Polytechnic 2019 registered candidates can generate the admit card by visiting the official website on entering the Date of Birth & Registration Number/Registration Number & Password. There will be no facility to get DCECE admit card 2019 through offline mode. Bihar Polytechnic 2019 Admit card contains the details like test venue details and address, gender, category, date and timings etc. Applicants are advised to carry a printout of DCECE 2019 admit card along with one valid identity proof. DCECE 2019 Answer Key: The official authority will release the Bihar Polytechnic 2019 answer key in online mode. With the help of answer key, candidates who took the Bihar DCECE exam 2019 can estimate their score. They need to calculate the correct and incorrect responses. Follow the marking scheme to calculate the estimated score. Through DCECE 2019 answer key, students can calculate their rough marks. The answer key will be published separately for each group of courses such as PE/PPE & PM/PMD courses. Bihar Polytechnic Result 2019 is likely to release after the publication of answer key. The DCECE 2019 Result is expected to release in the last week of July 2019. DCECE 2019 Result will reflect the performance of the candidate in the exam. Marks obtained, qualifying percentile, gender, category etc. To download the Bihar Polytechnic 2019 result, the candidate who took the exam in offline mode need to enter valid Date of Birth & Registration Number/Registration Number & Password. DCECE 2019 Rank Card: Along with the declaration of Bihar Polytechnic 2019 result, the official authority allot an individual rank to the candidates who took the Bihar Polytechnic exam 2019. To download the Rank Card of DCECE (Polytechnic Engineering) 2019, candidates need to select the programme given below and enter roll number, date of birth. They are advised to save, download and take the printout. It shall be required to produce at the time of document verification. The rank card includes the rank, category, gender, name and marks. The official authority allots seat in the college and stream based on the rank obtained in Bihar Polytechnic 2019 exam, seat availability, stream opted, cut-off percentile, marks obtained etc. Different dates for reporting at the document verification shall be published. Counselling will be organized via offline mode. Candidates need to report physically at the reporting centre with the correct set of documents. List of colleges needs to opt at the time of reporting. If you have any doubt related to Bihar Polytechnic 2019, then please write us in the comment box given below. Bihar Polytechnic/ Diploma (DCECE) 2018- Form Submission Closed! !